This section contains the basic postulations on various dimensions of Reality. Postulations are statements about Truth. These are in the form of aphorisms (सूत्रात्मक)- such that maximum knowledge is encapsulated in minimal words. Existence is Coexistence, as nature saturated in all-pervasive ‘space/energy’. Nature = collection of active units = physiochemical and conscious units. 10 activities in the Self (Conscious) and the 5 Potentials and 5 Forces. Knowledge of activity, time & decision making. 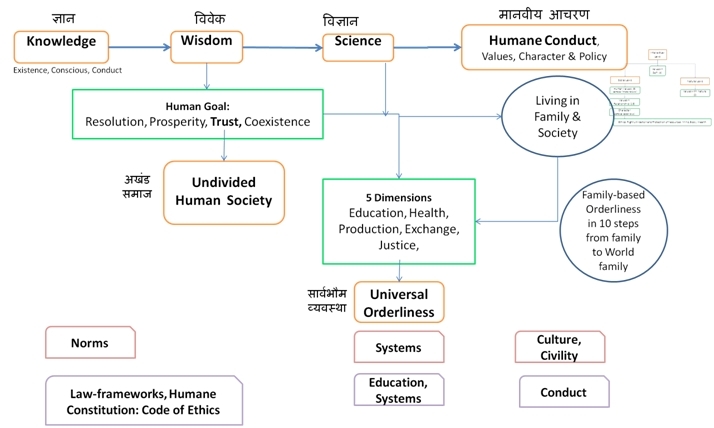 Sets the direction for Human-Goals identified in Wisdom. *Word & Meaning: – The words employed here have specific and precise meanings. While this site has the definitions, the meanings to these words are resident in a human being. The definitions link the words to meanings in existence. For example: the word ‘knowledge’ used here is with a different meaning/depth than what is usually assumed. It is recommended that you get in touch with someone associated with the study of Madhyasth Darshan (Jeevan Vidya) to understand what these words exactly mean; else one runs the risk of coming to premature conclusions based on wrong connotations extended to these words. Attending a 7 day introductory workshop (shivir) is a good starting point.